A small town called St Ives in Cambridgeshire. About 3 years now. Three of us were in a band together in our teens. It’s a cheeky dig at the media-created “hollow stars” of today. We couldn’t help ourselves! It’s a big riff filled sound and a modern take on classic rock. Strongly guitar led with solid beats punching through designed to make you want to bounce! We focus on the “show” element so you see lots of bouncing around and sweat! If people wanted to watch people stand still for an hour they can do that at a bus stop! The aim is to make people leave feeling like they have performed. Never before unfortunately. That makes it all the more special for us. 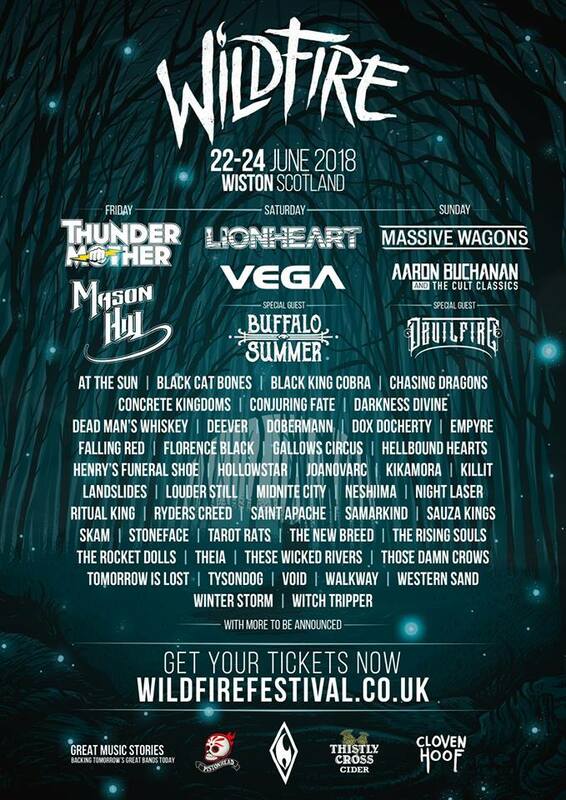 Wildfire has an incredible line up of some of the best up and coming rock bands around and we can’t wait to get amongst it all! Some old, some new. We want to make the set as big and bold as possible and always saving space for some crowd favourites. There is so many it’s hard to choose. One that has never lined up with my calendar space are Aaron Buchanan and the Cult Classics. I saw him with Heaven’s Basement and they were one of the influencers in us starting again with a new band. Also Massive Wagons. Those guys have had a great twelve months and I can’t wait to get to finally watch them live! A lot more festivals and shows! We are joining Graham Bonnet for a few dates of his tour in August and have something else special lined up for the end of the year. As it all gets finalised we will reveal all. To be fair it would change depending on what day you ask me. The love shown for our music is the best thing for me. This is a huge passion for us guys and to see people enjoying it is a great feeling. I couldn’t possibly put that in print, could I?! Again this would change every day but as you asked today I will go with Gorilla Riot to open as we gigged with these guys recently and they were awesome. Looking at who’s touring at the moment, I would love it to be a Myles Kennedy show. He is an incredible musician and to share the stage with him would be a dream come true. We are on the Sunday but no times have been released yet. Cloven Hoof rum for us!